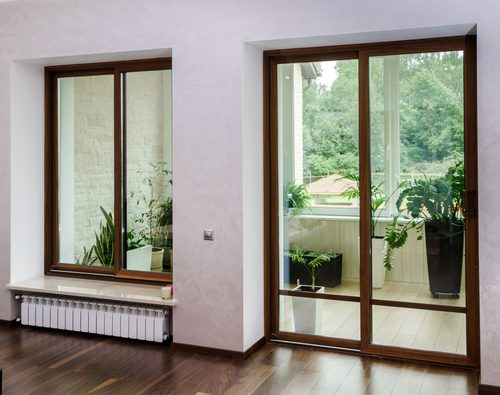 Looking to replace your sliding glass doors? Look no further! We will make your decision easier. Sliding doors have changed a lot over time. The simplicity inherent in sliding doors has not changed, but the look and efficiency has. Sliding doors remain the preferred choice for exterior doors leading to a patio or deck when space around the door is limited. Even when enough space exists to make French doors a viable option, many people choose sliding doors because of the economical nature of the doors and the ease and reliability of the sliding doors. Sometimes a design is so simple that it's almost perfect, and products are designed with the same basic concepts years and even decades later. The wheel comes to mind. While there have been many different sizes and looks of a wheel throughout history, and even now there are thousands of wheel designs available for all tastes, the basic concept of the wheel has not changed in... well, we don't really know how long. Sliding Doors: More Important than the Wheel! We know that the invention of the wheel helped to propel society to unexplored places and eventually to racetracks. Although not as importantly, we believe nearly as importantly, sliding doors have helped to propel kids off the couch and into the back yard for nearly as long as chickens have had feathers. For years, this simple invention has stood the test of time as the rear entry door of choice for homes all around the world. It seems like for the first every how many years of the sliding door's existence, it consisted of universally two large panes of glass with a metal frame and a top and bottom sliding track. Indeed, that exact door is still very prominent. And why shouldn't it be? It has served the world admirably in its service since the beginning of its creation, and the single pane sliding door continues to serve with distinction, silently gliding open and closed thousands of times per day as the kids alternate between wanting the freedom of the outside and the artificially conditioned climate of the inside. No worries, the sliding door, in its brilliant simplicity, glides open and shut for a lifetime without complaint. The classic sliding door is always a good option, but for homeowners looking for a more a little more panache, Fort Collins Windows & Doors is here to make your dreams come true! You can choose from the traditional standby sliding door, of course, but you also have the option of materials and colors to choose from. If you had your heart set on beautiful French doors leading out to the patio but the house's architecture makes the area too tight of a fit for doors that swing in or out, we have you covered. Check out our French doors that are also sliding doors! You'll get the luxurious look of the French doors, but you love the practicality of being able to fit this beautiful door through tight doorways. If you are in the market for sliding doors, we have lots of options to make sure that your sliding door installation fits perfectly with your home's décor and adds style and value to your home.